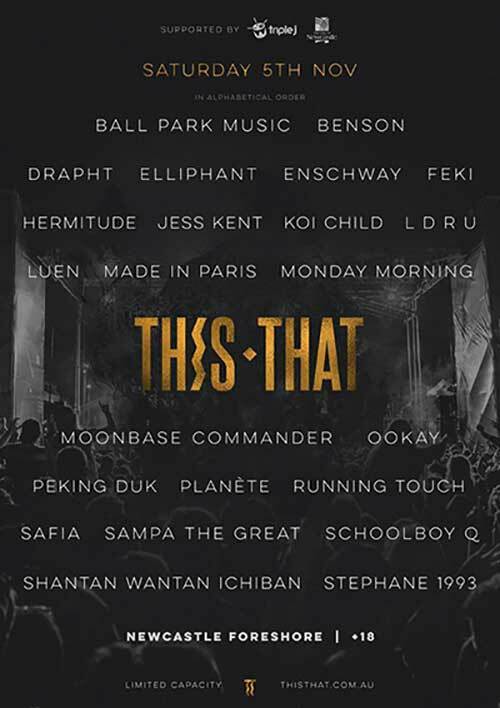 This That 2016: Line-Up Announced! Tri-Point Rigging » This That 2016: Line-Up Announced! The much anticipated second installment of This/That festival in Newcastle is finally on the horizon, and what a treat it’s going to be…! The lineup for this year’s festival was announced last week and, with top bill acts like Peking Duk and Hermitude, summer vibes and good times start here! In addition to the two main stages, This Stage and That Stage, dropping all your favourite summer anthems, punters will also be treated to another world full of spectacle over at The Other stage. Enter the portal and be pampered on a daybed like a gypsy prince or princess at the Love-Sik Bay, or transform into your wildest dreams with a stylised photo shoot. The Other is the ultimate bohemian chill zone, with a fairy light enclave and a La La Land for the legendary. You’ll find a killer local lineup there too, dropping the latest and greatest from underground and across the globe. Hunt&Gather will also join This/That again this year, curating a unique gathering place where festival lovers can not only get their fix of top quality retail goods and services, but also to let loose in the sand at this years pop up beach party, or even kick back on the giant daybed chilling under a canopy of shimmering streamers while dusk falls over the festival. This/That festival takes place at Newcastle Foreshore on Saturday 5th November 2016. Get your tix here.